Riparian forests are usually linear forests following the line of a river. The relationship between riparian forests and the river is very important. Do you know why? Click here and you’ll discover! Don’t forget to translate the text, you can work with a partner. Also, in the picture you have some clues about this relationship. From: The benefits of native species in riparian areas. 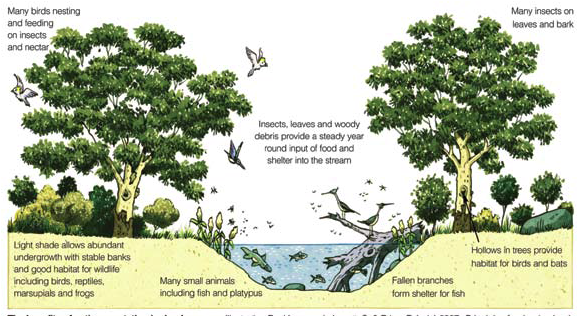 Illustration Paul Lennon in Lovett, S & Price, P (eds) (2007), Principles for riparian lands management, Land & Water Australia, Canberra.